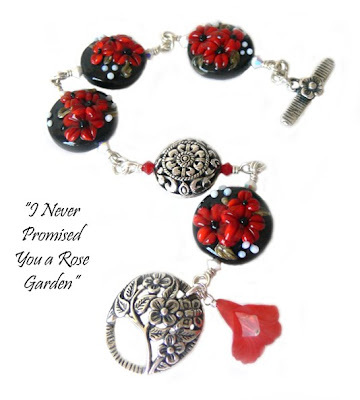 To see more jewelry, just click on over to www.lorianderson.net. Come on. You know you want to! 2. Family and friends who GET me. Nothing like understanding me and my quirks. 3. Friends of the kind that know I need them when I haven't even called for them. 4. A never-ending supply of beads. Keep making them, people. 5. Books. Books, books, books. Did I mentions books? 6. Health. That I have it, and that my husband's and son's is better than mine. 7. Life. And living it to its fullest, regardless of obstacles. Get a head start on your shopping! I haven't sent out a note to my email list yet, so lucky you get to enjoy the sale early! 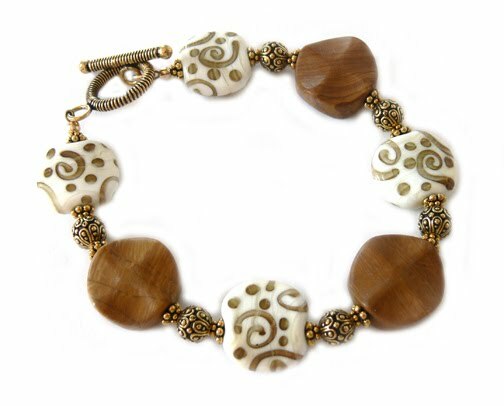 You receive 10% off by using code BLACK when you shop www.lorianderson.net from now until Dec 4. As always, shipping is free on purchases over $100 (and shipping is reasonable under that -- I HATE shopping only to find out the shipping costs more than what I bought). It's been a crazy few days! 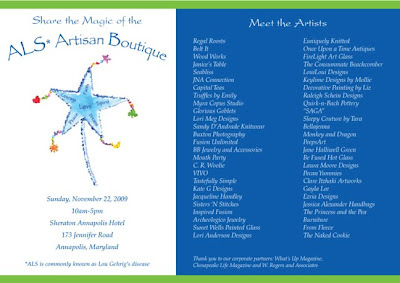 I had a wonderful time at the ALS Artisan Boutique in Annapolis, MD on Sunday. We all raised a lot of money to help raise awareness of Lou Gehrig's disease and ultimately work towards finding a cure. It was my last show of the year, and now I'll be adding a lot (a lot!) of new jewelry to www.lorianderson.net from now until Christmas. 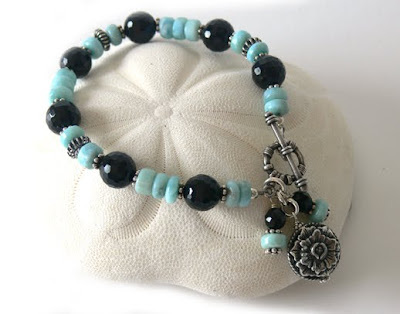 1) While making a bracelet on stretch elastic, I needed three hands -- one to hold the beads apart, one to hold the knot tight, and one to dot the knot with SuperGlue and then pull the elastic through the knot. So I did what made sense at the time -- after using the SuperGlue, I pulled the elastic through with my teeth. I ended up with glue on my teeth, the roof of my mouth, and on my tongue. Since I couldn't use the normal remedy for SuperGlue removal (nail polish remover), I had to resort to lots of tooth brushing, scraping, and laughing at myself. 2) After the ALS Artisan Boutique, my back was killing me. I have two bulging discs that flare up whenever I push them to the limit, and after lifting heavy boxes and bending/standing/bending while setting up my display, I was toast. So when I got home, I took a hot bath, a prescribed muscle relaxer, and fell into bed with a good book. About an hour later, though, I got hungry, and decided to go downstairs for a bite to eat. Those muscle relaxers worked a little to well! My foot slipped out from under me and WHOOMP. Down the stairs I went. Bump bump bumpity bump bump bump. I basically skied down the stairs on my backside. I landed on the last stair and my husband called out, "What did you just do?" 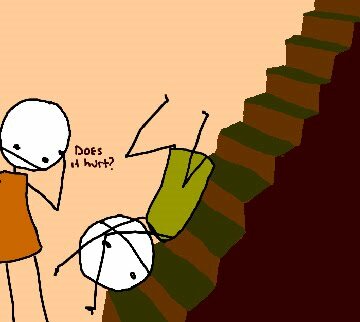 Me: "Fell down the stairs. I'm just going to sit here for a while. Carry on." Rick (undoubtedly shaking his head): "Alrighty then." Funny. Yes. Funny. Bruised my tail bone, but funny. 3) Yesterday I was in a rush to get out the door to pick up Zack from school and couldn't find my shoes, so I threw on a pair of flip flops. Still in rush mode when I got Zack in the van, my foot couldn't keep up and missed the floor of the van, deciding instead that it preferred to get tangled in the chain that pulls the side door open. That kind of pain makes you want to throw up. It's also the sort of pain that makes you nearly bloody your lip from biting it, as shouting Very Bad Words at the child pick-up line is frowned upon. NOT funny. Decidedly, absolutely, NOT FUNNY. So there you have my past few days. What's happened to you over the weekend that was Funny/Not Funny? 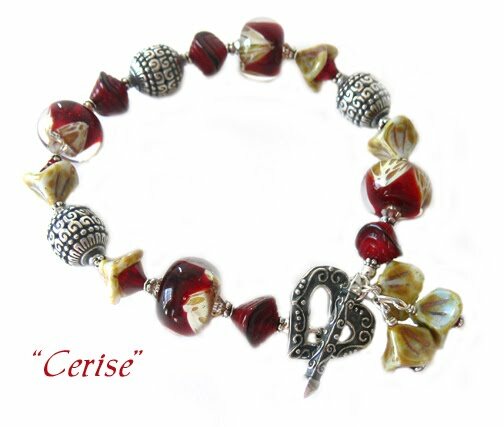 When Lori isn't falling down the stairs or gluing her teeth together, she makes jewelry. You can see her work at www.lorianderson.net. 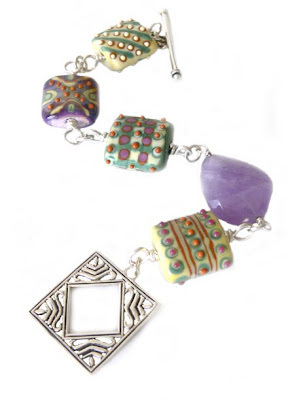 In August of 2009, I, along with several other jewelry artists, was featured in the Lapidary Journal Jewelry Artist magazine. The article was about how to make it on Etsy, a web site that holds thousands of small shops run by individual crafters and artists. Vintage finds and crafting supplies are also sold there, and I spend quite a lot of time there perusing the goodies. 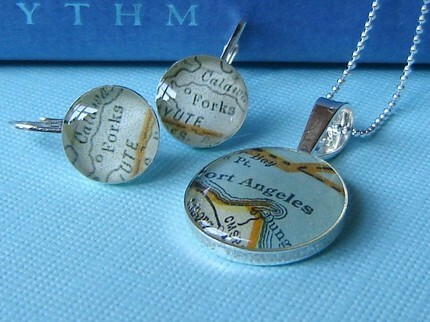 And I want I want I WANT this pendant with a map of Korea, city of Songtan, specifically, since that's where Rick and I met, but will wait until the Christmas rush is over before I order it. How COOL that you can get custom maps! In the magazine article, I was featured as an artist for whom Etsy didn't work. I had already established a website and a customer base that (at the time I opened my Etsy store) was four years old. 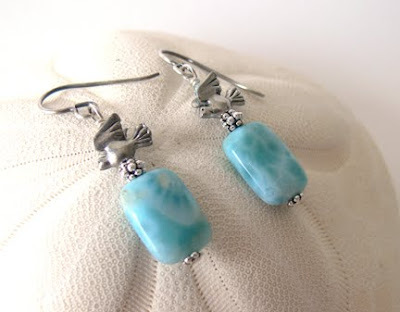 My existing customers didn't like going from one web site to another to view jewelry, and since I make 95% one-of-a-kind things, if they wanted to see it all, they had to. 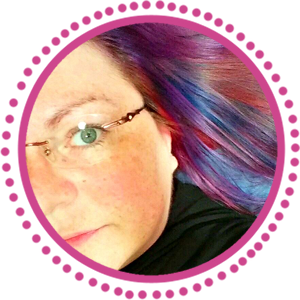 My own web site and craft shows also kept me so incredibly busy that I didn't have time to work on or promote my Etsy store, so while I made sales, it just wasn't worth the effort, so I closed shop and focused on buying -- and believe me, I buy a lot. Etsy and other similar sites are a good way to start out if you don't want to invest a lot of time and cash into a stand-alone web site. You can start your store quickly, build a web presence, and begin to grow. 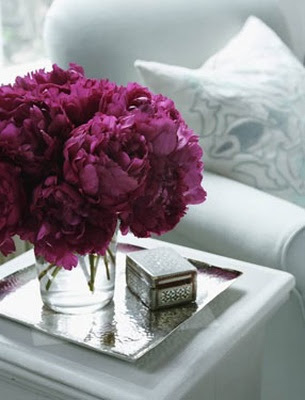 But watch out -- you'll also start peeking into other stores and buying the beauty you see around you. 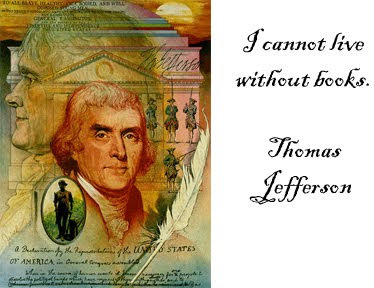 Thomas Jefferson and I have quite a lot in common. I cannot live without books. I learned to read when I was three, and my parents have no idea how, because they didn't actively sit down and teach me. They did, however, read over and over and over my favorite story at the time -- "Peter Pan". They figure I picked up reading from the million and ten readings of that book. I wrote in a previous post how excited I was that after two years of waiting, Diana Gabaldon's seventh book in the "Outlander" series was finally ready. I'd waited for this book like most people wait for Christmas. Her books are huge epic tomes, around 700-900 pages, and I had decided to reread the first six books in preparation for "An Echo in the Bone". The book came out September 22nd. As most of you know, I'm quite prolific with my book reading (look to the right, and you can see my Goodreads.com library), but since I've been battling a neurological disorder called intracranial hypertension, my eyesight has been affected by headaches and it's been slow going. Last night, however, I finally finished the first six books and TONIGHT (claps wildly!) I get to start "An Echo in the Bone". The problem will begin AFTER I finish Gabaldon's book. It's a problem that always happens when I finish a book that I love sooooo much that I feel like I've lived with the characters. What book can possibly follow in the footsteps of a book that I've loved so much? I also have an added problem -- over the past four months I've collected a healthy stack of books waiting to be read. A HUGE stack. A Heaven Stack. I've always said that my idea of Heaven is a huge library full of books, comfy chairs, huge airy windows, and an endless supply of Starbucks nonfat mochas. Heaven. I don't often talk religion OR politics (it's just asking for a punch in the face from someone), but I will say I'm tolerant of pretty much anything. I imagine Jesus, the Dalai Lama, and Ghandi walking into the room (*) and having a cup of something hot and asking me what book I'm reading. I imagine my son and husband sitting nearby with their Heaven Stack at their feet, reading bits of their books to me. I think that's a good vision of Heaven. "Under the Dome" by Stephen King. Oh I can't tell you how excited I am about this one and I'll probably read it right after "Echo". I held that HUGE volume in my hands and was so happy about all the new people to meet and stories to be told in this novel. "A Brief History of Nearly Everything" by Bill Bryson. I have the illustrated version, and Rick has read this one and told me I had to read it. "The Mysterious Benedict Society and the Prisoner's Dilemma"
"Diary of a Wimpy Kid: Dog Days"
I also have another juvenile lit book to read that I'm excited about because the author contacted me and sent me a copy to read and review. It's called "Big Bobby Boom and the Marble Mayhem", by Gregg Seeley, and flipping through it, it looks like fun. "Wait Until Twilight" by Sang Pak. I picked this up on impulse at the book store. Looks dark. "Hugh and Bess" by Susan Higginbotham. I read her first novel, "The Traitor's Wife", and it was fantastic. I love 14th century historical fiction, all the Eleanor of Aquitaine-era stuff, and I'm looking forward to this one! "Shantaram" by Gregory David Roberts. A friend kept telling me how I should really, really read this, so I finally got a copy. "The Big Rewind: A Memoir Brought to You By Pop Culture" by Nathan Rabin. Nathan writes/wrote for The Onion's art section - I imagine this will be a good one. And finally, books I've had on my bookshelves that I've totally forgotten to read over the years -- "Official Secrets", "The Late Child", "Letters of the Century", and "A Man in Full". Plus, I'm quite certain I'm getting books for Christmas, seeing as how I keep adding to my wish list on Amazon.com. I jokingly say that I can't die until all the books are read. At this rate, I'll live forever. Yes, I know, two posts in one day, but it's that sort of day. And you've heard the adage, "take two, they're small", right? Today I got a catalog in the mail, and serendipitously, it fell open to this page, and now, I. MUST. HAVE. Considering I had to call the neurologist yet again to tell him that the nerve block he did had worn off, this gift looks better than diamonds dipped in chocolate. (If you didn't read the update on my Facebook, I got about 16 shots in my temples and face a couple weeks ago to help one of my headaches). I have a gel eye mask, but its coolness lasts about 3 minutes. 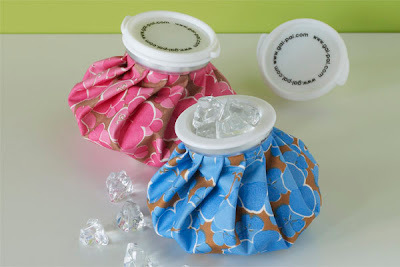 In case you get wicked killer headaches or knee aches or pain-in-the-whatnot aches, you can find this at RSH catalog (specifically, this page). I love this sign and I wish I knew who made it. 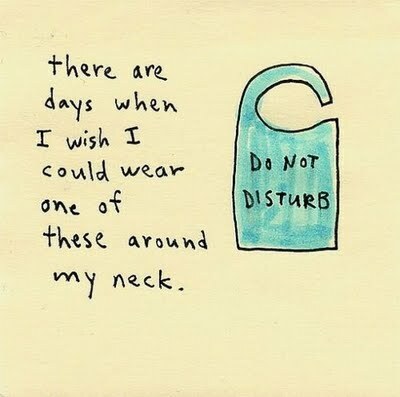 I am having one of those days. I still haven't figured out which one I am. 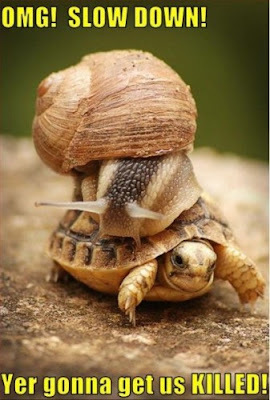 The turtle, who is chugging away as fast as she can to get to that deadline (which in my case, is getting beautiful things made for the ALS Artisan Boutique in Annapolis, MD) or the snail, who is getting NO sleep and is afraid she's going to fall off the edge of the world at any minute. Seriously, I am getting no sleep. I'm a natural insomniac -- I go in these strange cycles where I'll do fine for a while, heading to bed by 9pm with everyone else, read until 11pm, and then lights out. But lately, I'm super-hyper-charged and it's 2am before I know it and I can't get to sleep at ALL. I'm not tired during the day, really, and I do it all over again. It's making Rick a little nervous and worried, and he's afraid I'm going to make myself sick, and I'm liable to end up falling over like a cartoon character in mid-sentence (hopefully not in front of Zack's first-grade class when I go to help with their Book Fair), but for now, you wouldn't believe the things I'm making! So if you're anywhere close to Annapolis, MD, on Sunday, November 22nd, from 10-5, please come to the Sheraton Hotel and support local artists and galleries and help us raise money to find a cure for Lou Gehrig's Disease. It's a free event, but donations are appreciated, and there's a silent auction, a raffle for a computer (raffle tickets are only $5), wonderful string music, and it's just a fabulous event. Click the invitation to see who will be presenting and for more information, or click here. 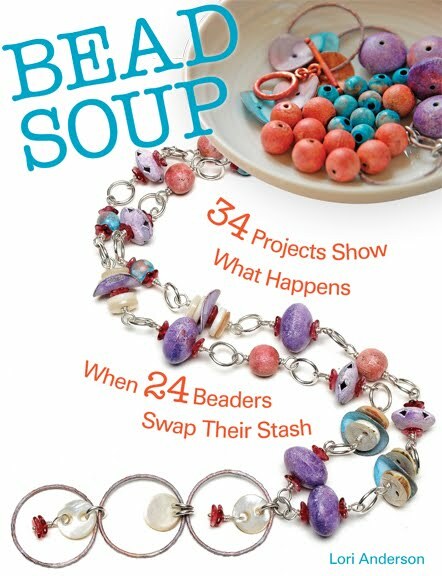 I got my issue of Step by Step Wire magazine today and was excited to see the catalog of classes for BeadFest. BeadFest is a huge extravaganza of classes, beads, and jewelry, and for the first time, I'm going to go. BeadFest is only a couple of hours away from me, yet I've never gone. Usually I'm either exhibiting at a show or preparing for a show. I'm taking a lot more time off next year to explore new techniques and to give my body a rest, so April 9th, I'm off to King of Prussia, PA! Another thing I'm excited about is finally getting to meet some of my online friends. Two of them, Kerry Bogert and Cassie Donlen, will be teaching, and others will be coming to take classes and shop. Honestly, meeting my friends will be the best part. 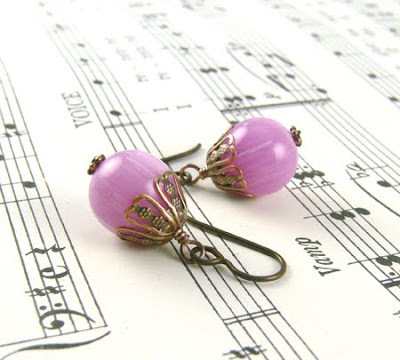 If you've always wanted to make jewelry, consider coming to BeadFest. Check out the web site at www.beadfest.com. With 150 booths to shop from and 80 classes, you can't go wrong! 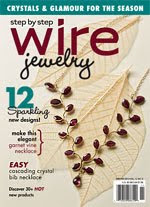 Also in this issue is a necklace I made. It's on page 38 in the Gallery. 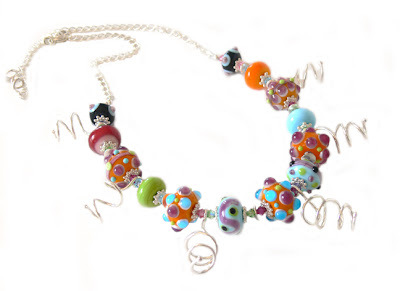 One of my awesome customers already owns this funky, whimsical necklace, and I have a similar one that is a bit more over the top! 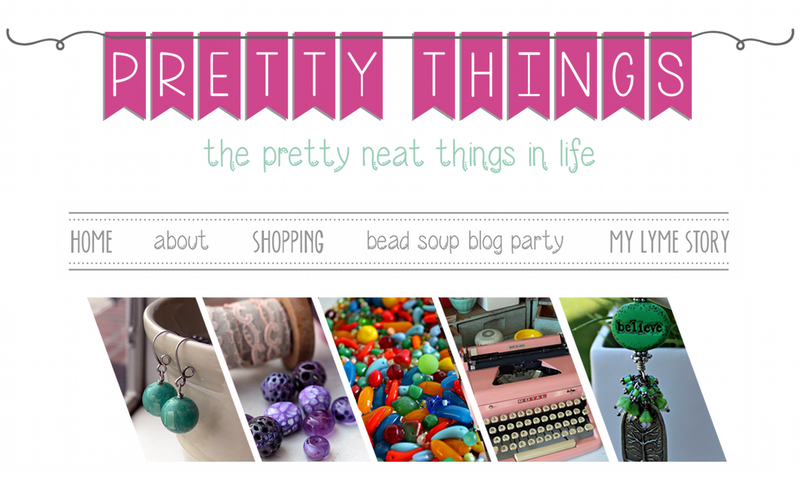 If you plan on going to the King of Prussia BeadFest, let me know -- I'd love to meet you! 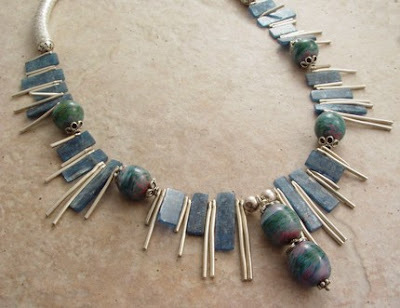 Lori Anderson designs jewelry in her studio in Easton, MD. She's also an avid reader who wishes there were 36 hours in the day. You can see her work at www.lorianderson.net. 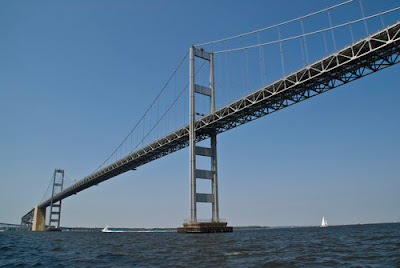 If you've been reading my blog for a while, you'll have seen the term "over the bridge". I'll write, "Today I went over the bridge to Barnes and Noble" or, "I went over the bridge with Zack to the aquarium." 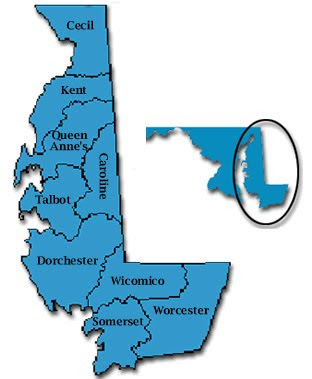 We live on the Eastern Shore of Maryland, or as I am fond of saying, "you know, the stickie-outie part of Maryland". The eastern shore is beautiful, but it's mostly rural, and therefore every so often I make a trip Over the Bridge. Today was one of those days, as Zack was off school for a teacher work day, and we'd planned an adventure day mixed with a few errands. So, what does this bridge look like? Why, this! Nearly five miles of terror. 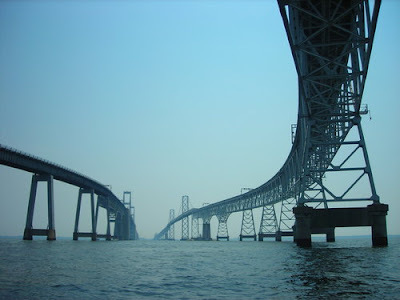 The Chesapeake Bay Bridge. Tall, imposing, three lanes going west, two lanes going east, with curves. And it's always, always got something under construction. When rush hour gets hairy and people are heading to the shore, there's this nastiness where they take the three-lane bridge and make one lane head east and two lanes head west. I call it Very Bad Names and drive with even whiter knuckles than normal. 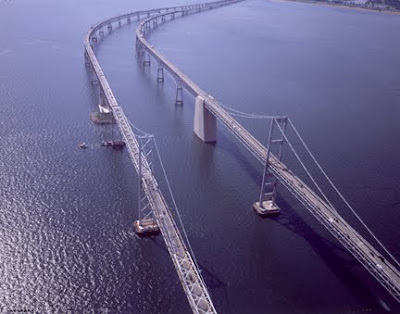 It took me a while, but after seven years of living on the eastern shore, I can now drive this bridge day or night without my spine crawling or my pulse speeding or needing a Xanax. Today, however, was different. 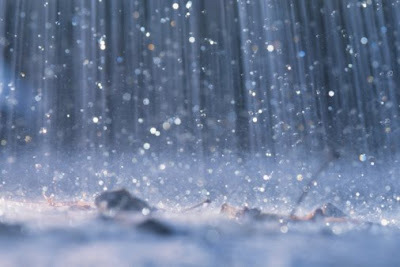 Today, I dealt with 30mph winds and pouring rain. Now ordinarily, when faced with 40° rain that the wind was driving sideways, I would have said, "Feh, let's watch Bridezilla's on TiVO" and called it a pajama day. But I'd made a promise to my son, and I keep my promises. Did I mention that we had to go over a bridge? There really is a point to this post. Even though it would have been fairly easy to bribe Zack into believing that a rainy day would be a perfect day to hang out and watch TV and play video games and basically stay indoors and be DRY, I made a promise. That bridge is hella scary, but I've driven it a million times -- in rain, snow, wind, darkness, and fog -- really, I had no excuse. So I left it to Zack. "Hey, Zack-man. It's icky out. You still want to go?" "OK then. Get your coat." 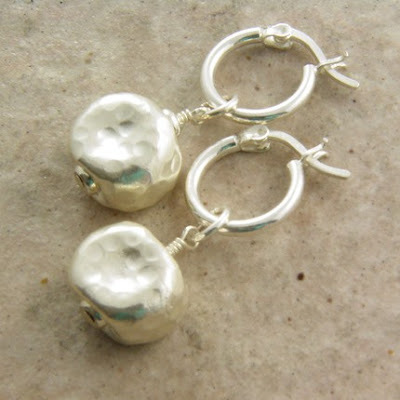 Today I'd like to highlight a fellow jewelry designer, Lisa Liddy. 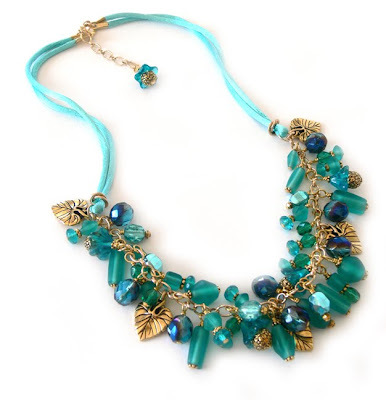 I own some of Lisa's jewelry, and you'd be doing yourself a favor by visiting her site, www.joolzbylisa.com. You're probably wondering why in the world I would promote someone else's jewelry, but it's like this -- I consider jewelry art. 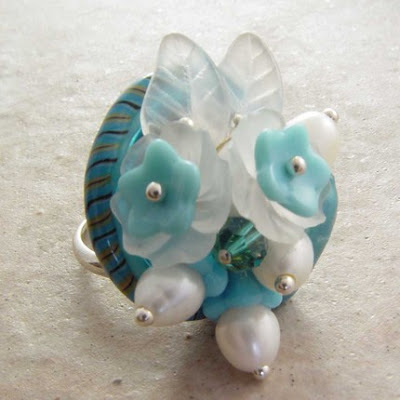 I own a lot of handmade art, from blown glass vases to paintings to collaged boxes to Other People's Jewelry. 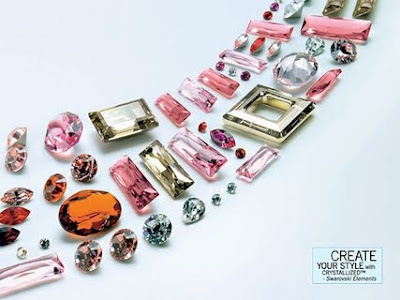 Jewelry is art (yes indeed it is!). When someone loves what they do, a piece of their heart goes into it, and to me, that's a huge part of the meaning of art. 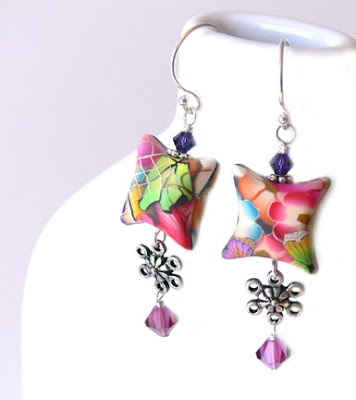 She also has a very clever earring creation called Changeables. 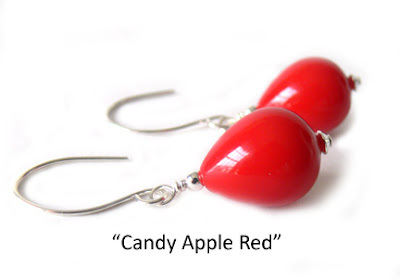 You purchase one pair of hoops that come with a beaded drop. 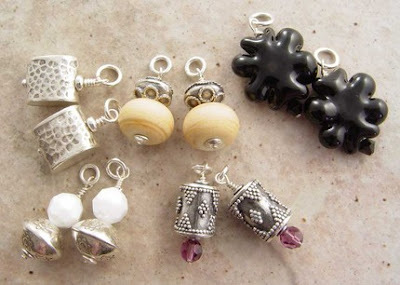 You can then purchase additional drops from her store (or email her for custom dangles) to have a fun, full jewelry box of earrings! I hope you'll visit her store (she offers FREE SHIPPING right now!) 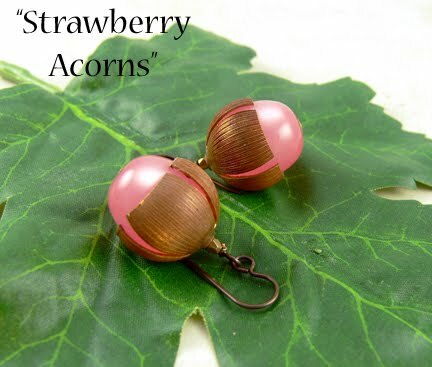 and take a look at her blog, her work with the Melonhead Foundation, and of course, her jewelry! And wave and say hello and tell her Lori sent you! If you've ever wondered what it's like being an entrepreneur, well, let me tell you. It's a lot more than shambling down the stairs in your pajamas with a cup of coffee and an endless day of joyful creating. 1) Oversleep. I have an excuse. I was up until 6am the night before working. 2) Due to oversleeping, missed my window of good light for photographing new jewelry. 3) Make coffee. Leave coffee on the counter when the dryer dings. Forget I made coffee. 4) Sit down at computer. Remember I have to stick postcard stamps on a 10" stack of cards. 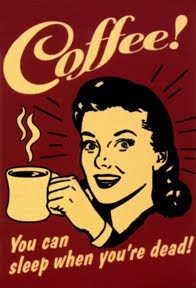 5) Remember coffee. It's cold. Make it again. 7) Where the hell is that danged coffee. 8) Sit down to computer. Have three orders waiting to be packed. Stop everything to pull orders, wrap, pack, print postage. Yell to whomever will listen to turn the television DOWN. 9) Say a Very Bad Word. It involves lack of coffee. 10) Open computer programs to work on web site. Notice that it is now 7:30pm. 11) Upload exactly two (2) pieces of jewelry before it's time to read to Zack. 12) Finally drink my coffee. It's 9pm. 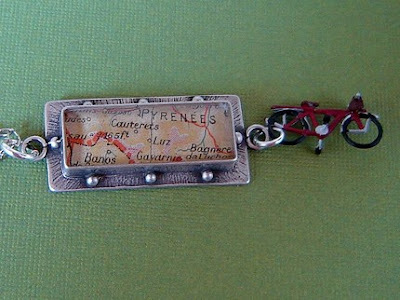 13) Everyone goes to bed, and thanks to coffee, I am up until 4am making jewelry. Woody Allen was right. "If you want to make God laugh, tell Him your plans." When Lori isn't searching for a Venti Starbucks Mocha, she's (trying) to create jewelry in her Easton, MD studio. You can see her work at www.lorianderson.net. 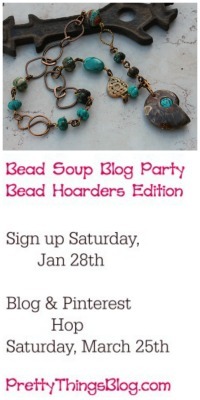 Attention All Beaders! ArtBeads.com Discount! 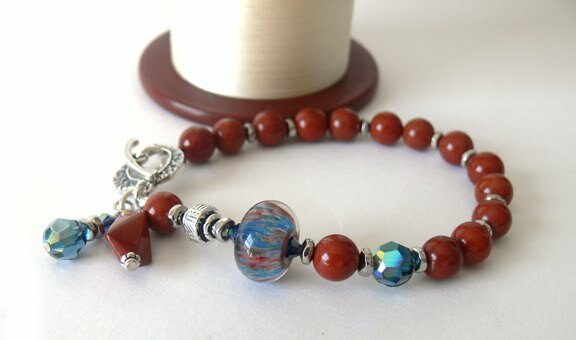 a 10% off coupon code to use at www.artbeads.com! So what will you buy? 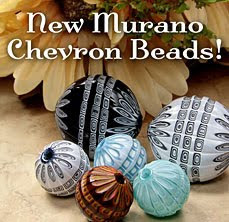 Their new Murano Chevron Beads? 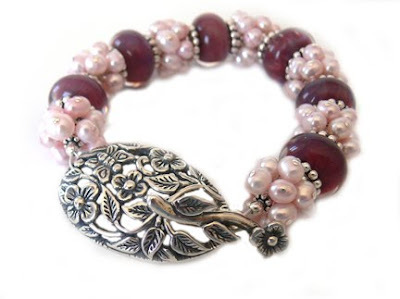 Another great things about ArtBeads.com is their shipping -- only $1 to Canada and FREE to the US. So what are you waiting for? Happy designing! 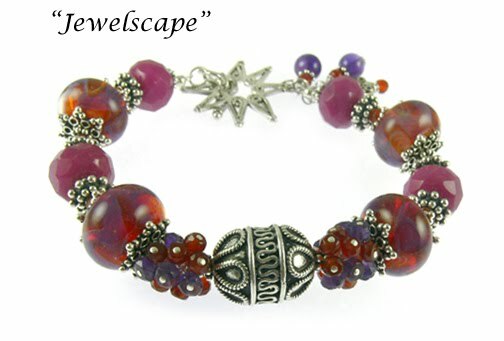 I have a new blog article on Watch Me Create that you can read by clicking here. 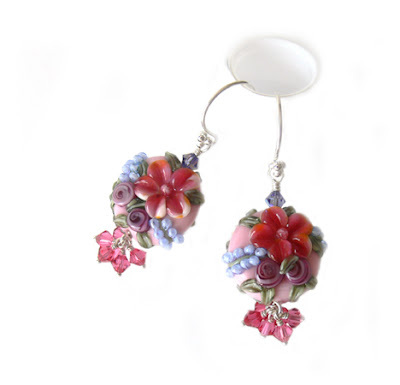 It's about how to create with dark borosilicate glass beads. 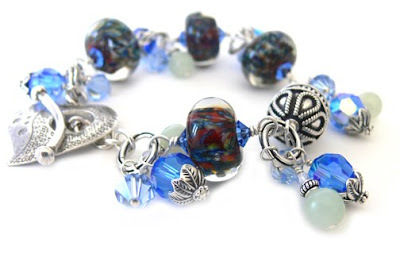 Boro glass beads are some of my favorites, but they also can look one way on the computer screen and quite another when they end up out of the package and on my work bench. 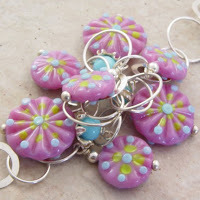 My article talks about how I work with such beads. In my house, no bead goes unloved! 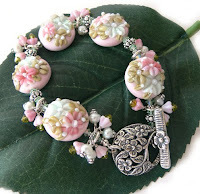 I hope you enjoy my article at Watch Me Create, and be sure to visit all the other contributors' offerings there as well! Lori Anderson designs and writes from her studio in Easton, MD. I've been working non-stop for my next show as well as for near-daily updates of www.lorianderson.net (and from now until Saturday, November 7th, there's FREE SHIPPING on all orders! ), so I don't have much to write about. Unless you count my telling you about 24/7 excruciating headaches or the chaos of a normally neatly organized household. But that would be boring. 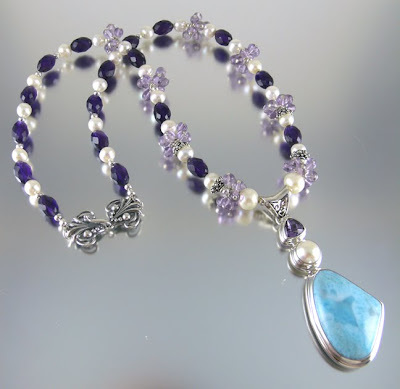 No, I'll leave you with Eye Candy Jewelry Day. As always, if you see something you want (none of these, as of this writing, have hit the web site yet), please email me to order! Click each photo for a larger view. 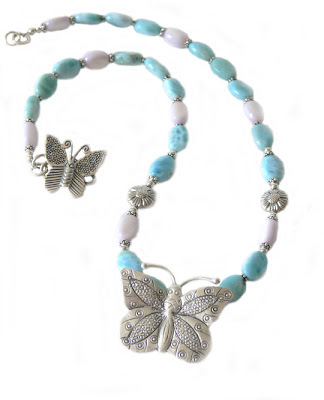 "Larimar Butterfly" -- rare larimar, purple mother-of-pearl, and large sterling silver butterfly (note the butterfly clasp!). You can see more jewelry, including holiday jewelry, at www.lorianderson.net.